Hah!! The title caught your attention, right? 😉 Hehehe..
No lar, not asrama.. we are sending her to a nursery, just a half day nursery. Some of you might know that I am gonna go back to work real soon.. well, it’s actually next week. And no more mommy at home to take care of Bella. It’s not easy to find a nursery for a 6 month old baby!! I have called up probably half of nurseries in KL (ok, I might have exaggerated that a little :D) but no place accepted her.. poor little Bella. The main reason why we wanted to send Bella to a nursery is because we wanted her to socialize more. She needs to see more people.. We noticed that she is becoming more aware of her surroundings and refused to be carried by strangers.. It’s called stranger anxiety syndrome and that’s not good. Bad for mommy and daddy too 😉 Hence the decision to send her to nursery/playschool. Tak lama, only from morning till noon.. 5 hours of socializing with other babies a day will do good for her. Besides, we are also looking for nursery that teaches babies and play with them, not just swaddle and put them to sleep. Bella doesn’t really sleep during daytime. After she wakes up in the morning, she will play and only sleep around 3pm.. that is almost 6 hours of play time!! And trust me, she is a handful!! So, last Friday, we went to see the place, typical childcare centre at one of the double story terrace near our house.. After meeting the caretaker, we are definitely sold!! We like the program that they have for babies there. Since both of us are working, that is the best we can provide her. So, Monday will be Bella’s first day at her nursery. And because of that, I postponed my first day of work from Monday to Tuesday (hahaha.. alasan!!) I don’t think I can work thinking of Bella’s first day at the nursery..
Posted on January 15, 2012 by Dr Halina Mohd YunosPosted in MommyhoodTagged first, nursery. Previous Previous post: Homemade Food.. finally!! Next Next post: Mommy Survived!! Hahha.. Timaseh atas kata2 semangat yg memberangsangkan kak eycha!! There’s always the first time..
My son pun duduk nursery sejak kecik..right after pantang I guess..But it’s true doc..baby duk nursery ‘tak perak’ tapi I pulak risau sbb my son until now..suke sggggt berkawan..dia tak takut org! jumpa semua orang dia slumber je ckp ‘hi!’…cuma bab berhingus tu la tak tahan..:( pas amik injection pneumococcal 2x..da ok plak dia..xde sakit2 mudah jangkit lagi)..
lol why most of them tak accept bella? Too young.. She’s only 6 month old..
yea, true..i noticed bella during nona, she easily cried when fara fauzana try to dukung her!! hehe..not good too..but nursery, good steps to socialize her!! Mmg dulu masa anak sulung, lepas 2 bln, saya anta nursery, on the way saya nk pi keje tu, belum smpi 1jam dh rasa rindu sgt melepaskan anak tu!! Tuhan jer tau!! Ya ALLAH!! aduhhh!!! saya menangisssss!!!! Dlm hati masa tuh meronta, “saya nk jg sndri baby sayaaa!!! 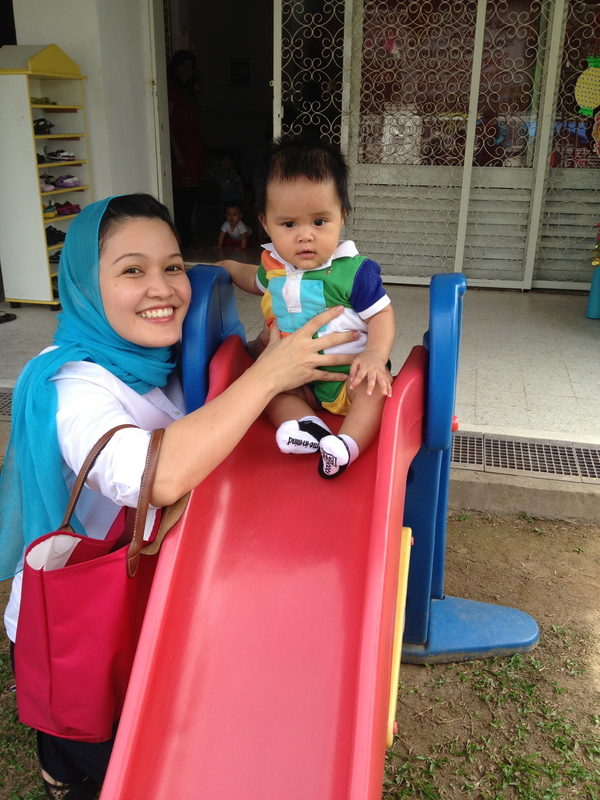 !” Hubby pujukla… kita nih fikir mcm2, anak kita ok ker dijaga cikgu di nursery tu, kita tgk orglaki x tau la, kurang perasaan kot daripada seorang ibu, nmpk mcm relax jer, x rasa apa2 ker anak kita ditinggalkan, huhu..tp so far semuanya ok Alhamdulillah sgt, mmg dijaga dgn baik..mmg ada ‘grooming’, siap potong kuku tiap2 jumaat.. senang mamanya 😉 mmg tak leh kenang time tu…setahun juga anak sulung saya dijaga oleh teacher kat nursery tu, mmg bagus. Skrg nih saya leh full time jaga anak3, Alhamdulillah sgt, & sampai skrg, saya amalkan mcm di nursery pulak, every friday, saya sndiri akan potong kuku anak3.. ha, bkn anak3 saja, papanya pn saya potong kuku jugak..hihi.. mmg afdal on thursday or friday kita potong kuku. Take care Bella.. InsyaALLah she will get used with others. betul3.. stok susu & bekalan makanan baby better disediakan sndri oleh kita.. dema nursery leh panaskan utk anak kita makan. mcm saya hari2 buatkan bubur utk stok anak makan di nursery dr pagi smpi petang. Boleh bg saya nama nursery di area ukay bistari tu? konon x mo hntar kt nrsery sbb kesian……. suruh mak yang jaga…..
skrang…. lagi haru sbb dia lebih close dgn emak saya drpd saya……. Eh sis Lina kata ada nanny yang akan jaga Bella? So,doctor…better prepared ur psycology now walaupun dh tau mesti akan nangis punye.,hahaha..feel the moment doc! tapi sampai kat tempat kerja, ok je..
Takde lah teringat sangat bila dah busy dengan kerja tu kan… Sedih tu normal lah..
Bella can walk oredi ? Psst.. kalau duk ngan atok selalunya terlebih manja maaaa…..
sorry i miss my ‘a’…*bella. Congratulation..good decision..fyi,i sent my daughtee to taska since she was 2 months old! At the first place i hantar halfday,bcoz i keje halfday,tp taska insisted suruh hantar from 7.30 to 5.30..then i wonder,she was a baby,bukan buat apa pun kan.than they said,byk lesson yg dia tertinggal,pasal mostly lesson start pagi..what kinda lesson i asked..flash card,grooming,mengaji..etc..i was amazed..alhamdulillah,now she is 2 years old,she learned a lot from taska.sometimes i do wonder why parents prefer hantar anak kat pengasuh,where they just sit and eat and sleep.betul tak? hi sis, kat mana taska u hnt ur daughter tu? blh share? first time baca n comment kat blog ni…. baby B will be okay! Ikut muka Dr Sheikh la Bella ni. Apapun, slmat bersosial. Lama2 nnti Bella lak x sbar2 nk pgi nursery. Bila mommy ambil, Bella lak nangis xnak balik rumah. Huhu. to BB bella:b a gud ggurl dear…missing my bb so much when i saw bb bella’s face….huhuhu….insyaAllah,keep it in gud workteam Bella….u must be strong because u r da’ leader for ur becoming sis or bro…anak sulung katakan…..
mcmna Bella arini?mommy & daddy ok ke tggal Bella kt situ? salam perkenalan ye dr harlina. i have same experience like u too..all the best!! Nak thu apa nama taska kat ukay bistari tu? Sbb sy pn nk anta baby kt situ. Sy duduk situ. hi what is the name of the nursery? thanks!